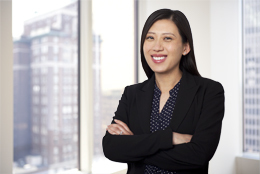 Dan-Feng Mei is an associate in the New York office and practices primarily in the firm's Intellectual Property, Patent Litigation and IP Counseling & Due Diligence Groups. Dan-Feng’s practice involves patent litigation and counseling in the pharmaceutical and biotechnology industries, focusing on litigation of patent infringement suits arising under Section 505(j) of the Federal Food, Drug and Cosmetic Act (Hatch-Waxman). Prior to joining the firm, Dan-Feng worked as a research assistant focusing her research on elucidating the complexities of the olfactory system through genetic manipulation.